This statement comes from "Akte Islam", November 2007. The German 'Pax-Europa' movement, founded by Secret-Services freak Dr. Udo Ulfkotte in 2006 in order to promote European values, like tolerance, Enlightenent and judeo-christian heritage, limits it's action to vulgar Muslim-bashing. 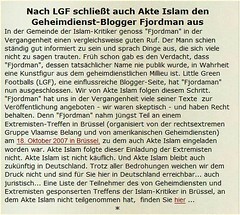 After the flopping of a pan-European anti-Eurabia manifestation on September 11 in Brussels, with Danish-English SIOE and the Vlaams Belang, Ulfkotte bans right-wing extremists and CIA-inspired people like Spencer and Bat Ye'or and their stooges (notably the so-called 'Fjordman') from collaborating with his ailing Pax Europa movement. Yesterday, Ulfkotte fusioned his Pax Europa club with the German 'Association of Citizen Movements', in order to get "observer status" with the EU, the European Council and, as if that weren't enough, with the UN too. We wish the new couple a happy honeymoon and we are eagerly expecting the inevitable clash between President Ulfkotte and CEO Schwend.